This is lovely in the shell pink, but not a good shade for Erica. She chose a beautiful pale blue, which, oh happy day, is on sale! You can access this pattern right over here. One of the best commercial fiber arts sites on the web is purlsoho.com . They’ve been around for a while, but recently revamped their website, and it’s a winner, exceptionally organized and beautifully photographed and presented. All the major fiber arts techniques (sewing, embroidery, crafting, weaving, knitting and crochet) have their own department, with patterns, tools, and tutorials. It all makes for very fun browsing. If you’re a knitter or crocheter who hasn’t seen the new PurlSoho site yet, you’re in for a treat. Many beautiful yarns, and on the product page for each one, there are pictures of related projects that the particular yarn is best suited for. Today’s free newsletter pattern immediately caught my eye, because of its unusual design in diagonal twist stitch. I also love the color, sheen, and drapiness of the Alpaca Pure yarn, which is worsted weight and comes in a range of other equally lovely shades. The color shown is called Grey Fig. The scarf is made using size 8 (US) needles, circular or straight, and requires 7 skeins of this particular yarn, which comes in skeins of 109 yards. The pattern, which includes a tutorial on this stitch, can be found here . Just noticed that the wrong side is every bit as attractive as the right, always a plus. Wow, this is pretty! It’s also a first – the first time I’ve found a free pattern that I like on my newsfeed on Facebook. 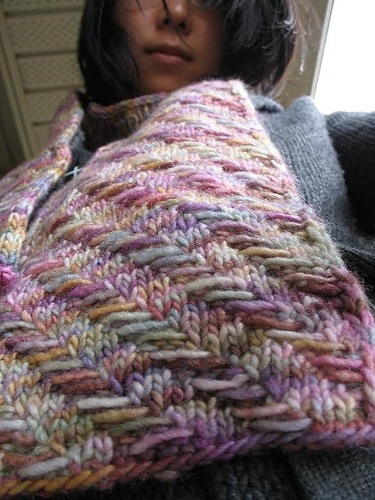 The pattern actually appears on the blog Feather And Fan: here’s the link. Definitely going to knit this, but not till I find just the right yarn. It’s near 90 and muggy today, so I probably won’t be doing that for a while…. Lion Brand has recently come up with some pretty cool new yarns, and some pretty new patterns to go with them. It’s not just Homespun anymore. This past winter, I crocheted two of their Simple Cowl using Unique, and this pattern is so quick and lovely (and warm!) that I plan to make more as gifts. Now they’ve released a new one, Textured Cowl, that uses Landscape, knitted on size 9 US circular needles. The diamonds within stripes effect is created with a slip stitch. The pattern is available right over HERE .